Jackson asked Congress to pass a "Force Bill" explicitly authorizing the use of military force to enforce the tariff. But it was held up until protectionists led by Clay agreed to a reduced Compromise Tariff. The Force Bill and Compromise Tariff passed on March 1, 1833. and Jackson signed both. The South Carolina Convention then met and rescinded its nullification ordinance. The Force Bill became moot because it was no longer needed. The United States Force Bill (enacted March 2, 1833) authorized U.S. President Andrew Jackson's use of whatever force necessary to enforce tariffs. It was intended to suppress South Carolina's nullification of tariffs. 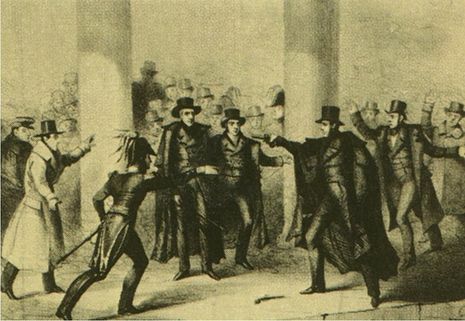 Opponents of the bill referred to it as Jackson's Bloody Bill or War Bill. The bill was a work of political mastery on Jackson's part as it gave the President the authority to close ports or harbors at his will. This in turn would require opponents to the tariff to travel a distance to carry out any threats or insurrection against federal facilities. Hostile acts against government facilities or personnel would then be considered pre-meditated and blatant.